Kingston announced its first SandForce-based solid state disks, they feature a SATA 6Gbps interface and use 25nm NAND flash memory from Intel. The specifications promise sequential read speeds of up to 525MB/s and write speeds as high as 480MB/s. Sustained random 4K read/write performance is 20,000 / 60,000 IOPS for the 120GB unit and 40,000 / 60,000 IOPS for the 240GB model, while max random 4K read/write performance is 95,000 / 70,000 IOPS and 95,000 / 60,000 IOPS, respectively. 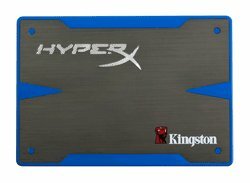 Kingston Technology Company, Inc., the independent world leader in memory products, today announced it has teamed up with SandForce® Inc., a leader in high-performance SSD (Solid-State Drive) processors, to launch its first SATA Rev 3.0 (6Gb/s) based SSD targeted at enthusiasts, gamers, and performance users. The Kingston HyperX® SSD feature the latest and most reliable SandForce controller to date, and is also available as a bundle with the HyperX Upgrade Kit for easy installation.